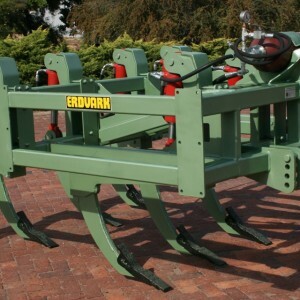 The Erdvark Hydraulic Reset Chisel Plough is available in 3-Point and Trailed models. The tines have a break away force of 10 kN. The tines working depth is 475 mm but can work in light soils up to 525 mm.The under frame clearance is 725 mm and optional depth control wheels are available. The shanks are fitted with a special knock-on tip that manufactured out of special hardened material with tungsten carbide infused onto the tips. Tine spacing can be set at 300mm, 400mm and 450mm. 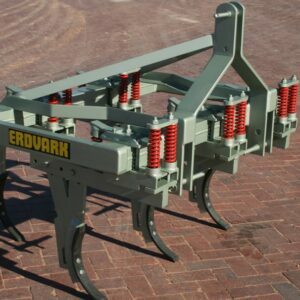 The 3-point Erdvark Chisel Plough with coil springs is excellent for orchards, vineyards and seedbed preparation. It has a welded mainframe with a 3-point hitch for suitable for CATI & II. The Chisel plough is available in 5, 7, 9 and 11 tines with 280mm spacing. The Chisel Plough has good penetration ability. The unique shanks are solid and can be set at different lengths and angles. The shank is fitted with a standard curved reversible chisel point. Each tine is coil spring loaded with a centre pivot action. The working depth is up to 300 mm.